Barcelona is one of the top tourist destinations in Europe, has a large variety of things to see and do, and has just as many choices when it comes to eating establishments. The city has something to offer everyone, but if you are looking for fine dining restaurants, then you are exactly where you need to be. Here are 5 of the best restaurants in Barcelona for you to enjoy. 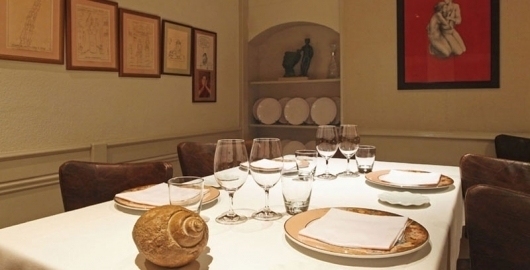 This restaurant was founded by Francesc Cánovas in nineteen eighty six. The restaurant has been mentioned in the Michelin Guide and has won a few other awards over the years. Here at El Racó d’en Cesc you can sample some rather interesting dishes such as Langoustines with chickpeas and grilled pig’s feet – very interesting indeed! A meal here will cost you around sixty Euros, but it is well worth every cent. Placa del Olles is a tapas restaurant where guests can enjoy some of the best Mediterranean dishes in the city. Tapas basically mean that you are getting a few small dishes instead of large plate of food. Most of the dishes here consist of traditional Spanish food or seafood, and will cost you between thirty and fifty Euros per person. Individual dishes are also available at around five Euros per dish. This is one of the restaurants that will cost you a little more, but the food and wine is spectacular, and the service is just as good. Moo has got a strange name, but there is nothing strange about the Catalan cooking that this establishment has to offer. A main meal will set you back between sixteen and twenty Euros. The special tasting menus are priced around one hundred and forty Euros, but they include a lovely selection of handpicked wines. This place is known to get extremely busy at certain times of the night. So much so, that there are actually queues that forms outside the restaurant. Dining here is all about the experience, and booking a table upstairs will allow you to see why. Dining on the first floor of this two storey restaurant will give you the opportunity to enjoy the fantastic food and the even better view. ABac does not have a very large menu, but what Chef Jordi Cruz has come up with is worth every cent. You are sure to remember each and every bite of your meal here at ABac. Here at this Michelin star winning restaurant, you can order baby squid with mushrooms and calamari done to perfection. Fine dining at this establishment will set you back as much as two hundred and sixty Euros, but this include a night’s stay at the adjoining hotel. Not that bad a deal for the price. These are only 5 of the best restaurants in Barcelona; there are many other places to enjoy a tasty meal at. Check with the local tourist information centre for a list of all the places available. Where ever you choose to dine, remember to relax and enjoy the Spanish hospitality.